With much improved battery life and more powerful integrated graphics, Intel’s fourth-generation Haswell processors represent a huge leap forward for Ultrabooks. But with high-resolution displays, SSD drives and Windows 8.1 now the norm, which Haswell-powered Ultrabook reigns supreme? 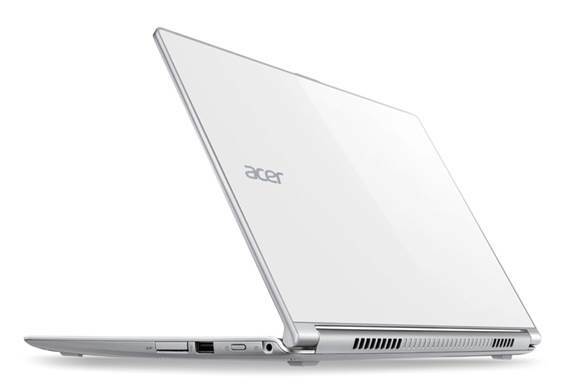 Acer didn't introduce a new Ultrabook model for 2013, choosing instead to refresh its well-received 2012 Aspire 57 with a new fourth-generation Intel Core i7-4500U 1.8GHz processor, and a boost in RAM from 4GB to 8GB. 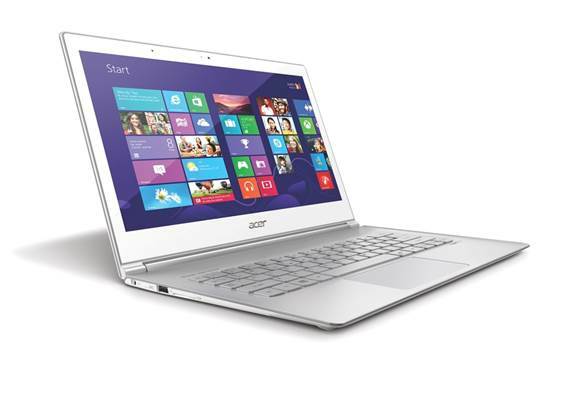 We're fine with the lack of innovation because the Aspire S7 remains one of the best-designed Ultrabooks available. It's the thinnest Ultrabook in our shootout, measuring just 11.9mm, and it's also light at 1.3kg. The overall design is also surprisingly tasteful for an Acer product, with a clean all-white aesthetic, which includes a sleek Gorilla Glass lid, and an aluminum unibody chassis. Its clickpad is both well sized and responsive, and we're also quite fond of its backlit chiclet keyboard, which, while a bit on the shallow side, offers a firm and comfortable typing experience. There's just one questionable design decision: The power button is awkwardly located out of sight on the left edge, between the power and USB port, which can take a bit of getting used to. One area where we would like to have seen an upgrade is the display, where the S7 now falls behind a few of its competitors, including the ASUS Zenbook UX301, Lenovo Yoga 2 Pro and HP Spectre 13. At 1920 x 1080, the Gorilla Glass 2 Full HD touchscreen display is still more than sufficient, but when scrutinized next to the 2560 x 1440 resolution displays of the Zenbook UX301 and Spectre 13, there's a small, but noticeable, step down in clarity. Having said that, at a relatively compact display size of 13.3-inches, it's hard to see much difference between each model when you're sitting a distance away from the screen, and the S7's Intel HD 4400 integrated graphics will certainly have an easier time driving the lower resolution display. In terms of value, the S7 is priced slightly on the high side (surprising for an Acer), with the i7 model coming in at $2,498. Two years ago, ASUS introduced its Zenbook series of Ultrabooks, a premium range of ultraportable notebooks with high-end hardware and luxurious materials. The latest addition to that range, the Zenbook UX301 (known in other parts of the world as the Zenbook Infinity), continues that tradition, and is one of the first Ultrabooks to use Intel's new Core i7-4558U 2.8GHz processor with Intel Iris 5100 integrated graphics. It also sports dual 128GB SSDs in RAID 0 configuration and a 13.3-inch QHD+ 2560 x 1440 resolution display. The Zenbook UX301 shares much of the design philosophy of previous Zenbooks, with a full aluminum build and the Zenbook's trademark swirl pattern lid. Like the Acer S7, the UX301 lid is also extra durable with a Gorilla Glass panel over the aluminum providing extra scratch and torsion resistance. 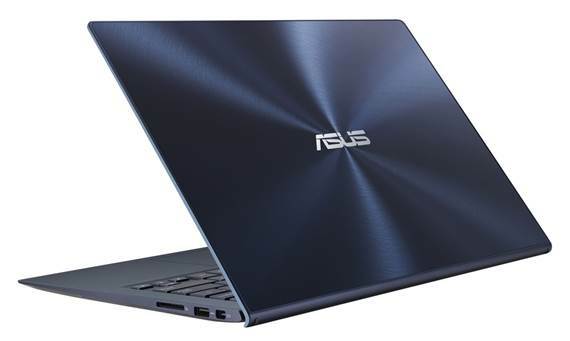 Eschewing the usual silver or grey colors, ASUS has opted for an interesting dark metallic blue for the UX301, which certainly helps it stand out from the crowd. On the inside, the Zenbook's wrist rest sports a matte Gorilla Glass cover, which provides a very comfortable and smooth typing surface. The backlit, chiclet keyboard has firm, if slightly shallow, keys, but the overall typing experience is fairly pleasant. The original Zenbook was let down by its often unresponsive trackpad, but three generations later, the UX301 has no such issues, tracking both accurately and responsively. Like HP's Spectre 13, the Zenbook UX301 boasts a 2560 x 1440 resolution display, which rivals the 2560 x 1600 resolution display found on Apple's 13-inch Retina MacBook Pro. Clarity is excellent, and the display is also bright with decent viewing angles. Unfortunately, all of the Zenbook UX301's premium touches don't come cheap. At $2,798 it is, by far, the most expensive Ultrabook in this shootout.